There are currently 95,310 users on this website. 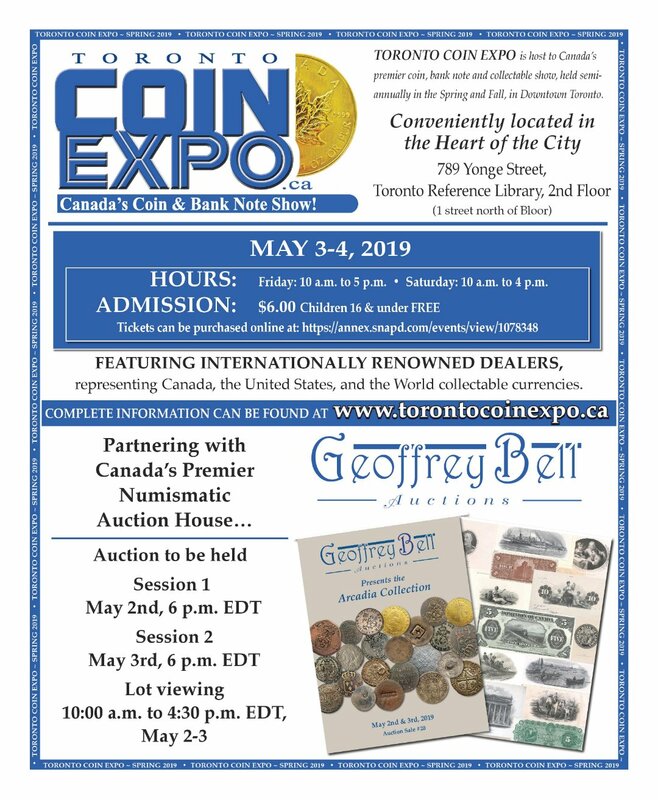 Join us at the Toronto Coin Expo, Canada's premier coin and banknote show and auction, located in downtown Toronto. Featuring 35+ internationally renowned coin and bank note dealers, representing Canada, United States, and the World of collectable currencies. This is the place to buy, sell, appraise your coins, banknotes, tokens, medals, militaria, gold and silver. You are sure to find a one-of-a-kind coin or banknote treasures! THIS IS AN EVENT YOU WILL WANT TO ATTEND! Daily admission is $6, and Kids 16 and under are FREE! AUCTION: Conducted by Geoffrey Bell Auctions, offering an assortment of numismatic items. Auction is free attend and open to the public. Thursday May 2 - Friday May 3, 2019. Join Us on Saturday May 4, 2018, for Educational Workshops, FREE for Kids and to attend with paid admission to the Toronto Coin Expo. 10:15am: Coin Collecting For KIDS - Learn what Collecting is all about! 10:45 am: KIDS Coin Auction - A fun-filled auction for young collectors using school play money to buy real items! For more information visit http://www.torontocoinexpo.ca, or contact us at torontocoinexpo@gmail.com, 647-403-7334.